To gain insight into which quality attributes are of greatest concern to agile practitioners, researchers analyzed stakeholder concerns from 15 years of Architecture Trade-Off Analysis Method data across 31 projects. Dominant concerns include modi ability, performance, availability, interoperability, and deployability. Concerns about long-term deterioration in large-scale agile projects’ quality (called technical debt1 ) have renewed the agile community’s interest in software architecture.2-4 This interest indicates a growing consensus that a strong architectural foundation lets teams rapidly evolve complex software systems using iterative, incremental development. This position is consistent with arguments in IEEE Software’s Mar./Apr. 2010 special issue on Agility and Architecture. meeting near- and long-term quality attribute goals (without which the project can grind to a halt because system complexity makes ef cient modi cations impossible). Quality attribute prioritization in particular can be difficult in early increments, and a wrong decision can result in hard-to-modify, unreliable, slow, or insecure systems. 5 So, we sought to obtain empirical evidence on the most common quality attribute concerns that projects must address and their relative importance. We performed a meta-analysis on the results of several Software Engineering Institute analyses carried out over the past 15 years using the Architecture TradeOff Analysis Method (ATAM). The ATAM leverages quality attribute scenarios that project stakeholders have identified and prioritized and uses this information to evaluate the architecture and identify architectural risk. (For more on the ATAM, see the related sidebar.) Here, we examine our analysis results and describe how agile teams can use them to prioritize and allocate quality attributes. The sidebar “Our Analysis Methodology” describes our method. SEI’s ATAM analyses cover a range of project types across government and industry domains. Table 1 categorizes the data into IT versus embedded systems, and government versus nongovernment projects. Ozkaya and her colleagues’ paper detailed Study 1’s project profile. Study 2 included nine projects and 348 quality attribute scenarios; these projects were more heavily weighted toward IT (78 versus 42 percent). Figure 1 compares the two studies’ results, which don’t include categories with fewer than three scenarios. (We didn’t include them because their scenarios tended to be more context specific or less generalizable.) The top quality attribute concerns were consistent. For example, modifiability was the most common quality attribute in both studies. Performance was the second-mostimportant attribute in Study 1 and third (by a small margin) in Study 2. This suggests that although the technical environment for software intensive systems has evolved over the years, the most important stakeholder and architectural concerns haven’t changed much. We now look at this data’s implications. As we mentioned before, modifiability ranked highest in both studies (24 percent in all scenarios for Study 1, and 26 percent for Study 2). 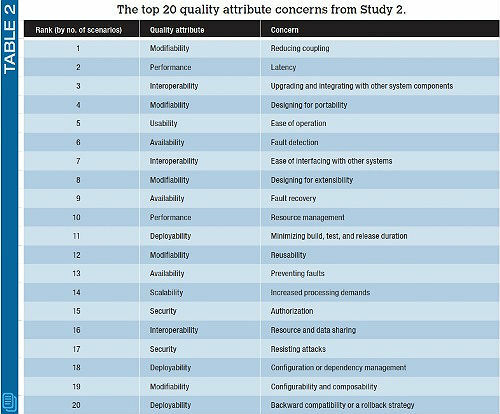 As Table 2 shows, ve of the top 20 quality attribute concerns were modifiability related. So, we performed a detailed analysis of these concerns. Table 3 summarizes and ranks the modi ability concerns. The top two concerns in Table 3 comprise 47 percent and focus on anticipating software changes. A variety of system types are represented in the ATAM data; anticipated changes included adding or replacing thirdparty components, adding new sensor types, replacing algorithms, and changing UI content. However, stakeholder concerns related to change weren’t limited to the software application alone. A signi cant number of the scenarios focused on changes external to the software, such as OS replacement, network modi cations, new technology integration, and hardware platform upgrades. A list such as this, derived from real project data, can help teams reason about future changes they should consider and avoid being caught off guard by an impactful, unanticipated change. FIGURE 1. The distribution of quality attributes covered in the two studies. The top quality attribute concerns were consistent across both studies. FIGURE 2. 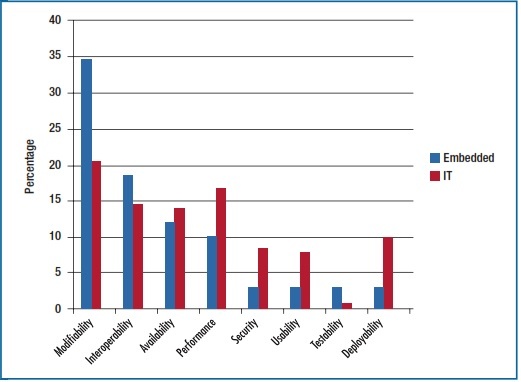 The distribution of quality attribute concerns for IT and embeddedsystems projects from Study 2. Modifiability concerns were much more prominent in embedded-systems projects. The Architecture Trade-Off Analysis Method (ATAM) lets developers analyze software and system architectures with respect to quality goals. The ATAM has a long pedigree—government and commercial organizations have been using it for more than 10 years—and substantial supporting documentation, including books, papers, and training courses. The ATAM normally involves two phases. Phase 1 elicits information about the architecture from the architecture team; phase 2 elicits project stakeholder needs. 1 The ATAM’s component techniques have been developed and refined over the years. One such technique is quality-attribute-scenario analysis, which captures architecturally focused requirements from stakeholders. Such analysis follows a structured format defined in six parts: an explicit stimulus, a stimulus source, an explicit response, a response measure, the environment, and the artifact the scenario affects. Another technique is a utility tree, which is a hierarchically organized af nity grouping of quality attribute concerns and scenarios derived from a particular project. 1 Finally, quality attribute tactics are architectural design primitives that ATAM evaluators look for in the architecture to quickly assess the architects’ strategies. 1 The structured nature of these techniques helps ATAM teams perform elicitation and analysis of quality attribute information in a consistent manner. Reference 1. P. Clements, R. Kazman, and M. Klein, Evaluating Software Architectures: Methods and Case Studies, Addison-Wesley, 2001. Performance, interoperability, and availability concerns also occurred frequently. Because of space limitations and because the interoperability concerns found in the dataset were often similar to the modifiability concerns, we focus here on performance and availability. Tables 4 and 5 summarize and rank the performance and availability concerns. A common theme emerges. Most scenarios focused on maintaining critical capability and consistent response times in the face of partial or major system failures (80 percent of the performance scenarios and 64 percent of the availability scenarios). Failure scenarios included loss of hardware, software failures, network outages or failures, dramatic load increases, and synchronization failures. We suggest that besides modifiability, teams should consider these types of failure scenarios when reasoning about work they might need to plan for. Figure 2 shows the differences in quality attribute concerns between IT and embedded-systems projects from Study 2. 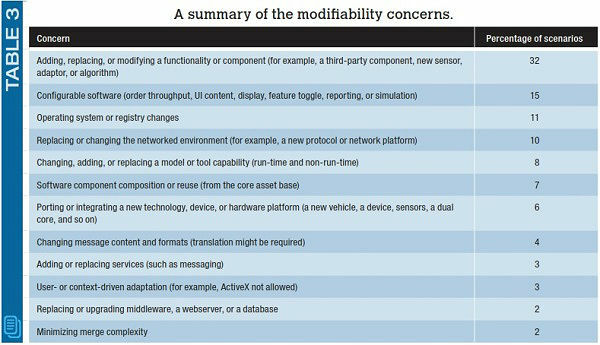 Modifiability accounted for almost 35 percent of the embedded-system concerns—15 percent more than any other quality attribute category. In contrast, although modifiability was the most important concern for IT projects, there wasn’t as much of a gap between it and the other quality attributes. Most IT project quality attribute counts, including modifiability, ranged from 14 to 20 percent. These numbers could reflect either the system’s underlying quality attribute requirements or the design’s current perceived problems. If the former is the case, this finding suggests that for embedded projects, developers must consider requirements that promote portability and encapsulation to reduce the impact that changes have on external subsystems (such as hardware or networks) over time. For IT projects, the more even spread across quality attributes suggests a need to balance requirements considerations more broadly. Although no one-size-fits-all list of quality attribute concerns exists, we propose that these project-specific views can be useful when developers are considering how to prioritize in an IT-versus-embedded context. 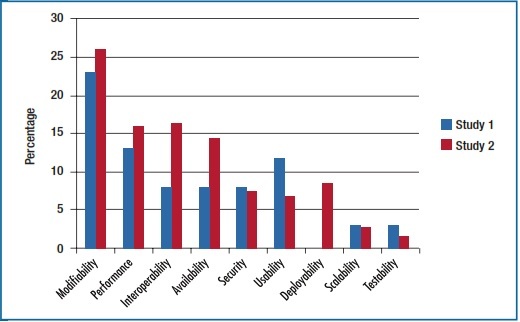 Deployability represented 10 percent of the quality attribute concerns for the Study 2 IT projects. This quality attribute has emerged only recently (it was only in the 2006–2013 data), so we looked more closely at the related scenarios. 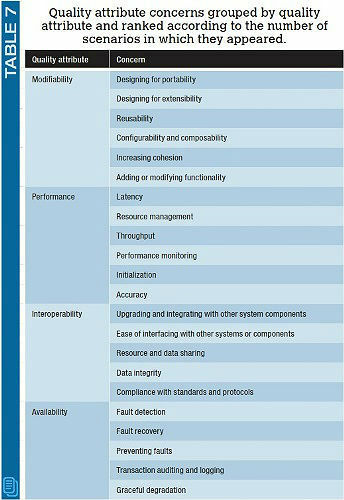 Table 6 lists the deployability- related scenarios from the ATAM data. Although these concerns cross-cut many existing quality attribute areas, such as modifiability, we found that the goals driving deployability were different, as were the response measures. Scenarios 1 through 4 aimed to reduce complexity and reduce deployment and testing cycle times. Scenarios 5 and 6 emphasized minimizing ripple effects due to change; however, the overarching stakeholder concern was change management for a complex distributed deployment environment. 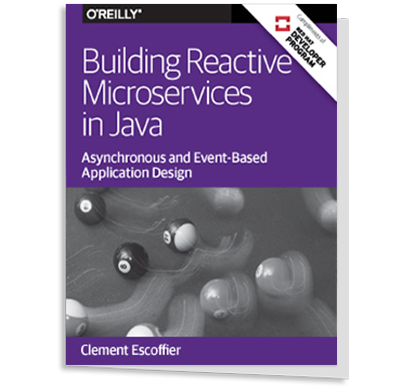 Reducing deployment and automated testing cycle time is a focus for books on this topic, such as Jez Humble and David Farley’s Continuous Delivery.8 These scenarios could give teams a starting place for reasoning about ways to enable their deployment goals. The data and concrete examples we present here can help agile teams determine which qualities to focus on when working on early increments and planning future increments. Teams can incorporate high-ranking quality attributes and quality attribute concerns (including examples) as checklists at designated points during the incremental life cycle. This will help them quickly assess whether they need to consider a specific quality attribute concern to support an anticipated business need. Evolving a system’s architecture in an agile project presents unique challenges. We suggest weaving quality attribute concerns into the life cycle 9 that a project team is using; this provides natural opportunities to incorporate the considerations we present here. For example, during agile retrospective meetings, the team might brainstorm about quality-attribute-related deficiencies that surfaced in the prior increment. During sprint planning, the architect could propose addressing a quality attribute concern and, if the product owner agrees, add it to the sprint backlog. This data also provides ammunition for the agile team lead in making the business case to the product owner by justifying the importance of dealing with such concerns architecturally. Our ultimate aim is to provide systematic support for iteratively addressing architectural concerns in agile projects. Techniques for efficiently identifying, prioritizing, and allocating architecture tasks to iterations and measuring their ongoing effects on project velocity are fundamental to this work’s success. Regarding future applicability, data such as this could also serve as input to decisionsupport-system models11 that provide automated support for reasoning about quality attribute tradeoffs. N. Brown et al., “Managing Technical Debt in Software-Reliant Systems,” Proc. FSE/SDP Workshop Future of Software Eng. Research, 2010, pp. 47–52. S. Ambler, Disciplined Agile Delivery: A Practitioner’s Guide to Agile Software Delivery in the Enterprise, IBM Press, 2012. D. Leffingwell, Scaling Software Agility: Best Practices for Large Enterprises, Addison-Wesley, 2007. S. Bain, Emergent Design: The Evolutionary Nature of Professional Software Development, Addison-Wesley, 2008. S. Bellomo, R. Nord, and I. Ozkaya, “A Study of Enabling Factors for Rapid Fielding: Combined Practices to Balance Tension between Speed and Stability,” Proc. 2013 Int’l Conf. Software Eng., 2013, pp. 982–991. I. Ozkaya et al., “Making Practical Use of Quality Attribute Information,” IEEE Software, vol. 25, no. 2, 2008, pp. 25–33. P. Clements, R. Kazman, and M. Klein, Evaluating Software Architectures: Methods and Case Studies, Addison-Wesley, 2001. J. Humble and D. Farley, Continuous Delivery, 1st ed., Addison-Wesley, 2010. F. Bachmann et al., “Integrate End to End Early and Often,” IEEE Software, vol. 30, no. 4, 2013, pp. 9–14. J. Ryoo, P. Laplante, and R. Kazman, “In Search of Architectural Patterns for Software Security,” Computer, vol. 42, no. 6, 2009, pp. 98–100. N. Ernst and I. Gorton, “Using AI to Model Quality Attribute Tradeoffs,” Proc. IEEE 1st Int’l Workshop Artificial Intelligence for Requirements Eng. (AIRE 14), 2014, pp. 51–52. Stephany Bellomo is a senior member of the technical staff on the Software Engineering Institute’s Architecture Practices team. Her research interests include architecting for agility, technical debt, and DevOps and continuous delivery. Bellomo received an MS in software engineering from George Mason University. She’s a senior member of the IEEE Computer Society. Contact her at sbellomo@sei.cmu.edu. Ian Gorton is a senior member of the technical staff on the Software Engineering Institute’s Architecture Practices team, where he investigates issues related to software architecture at scale. His research includes designing large-scale data management and analytics systems and understanding the inherent connections and tensions between software, data, and deployment architectures. Gorton received a PhD in computer science from Shef eld Hallam University. He’s a senior member of the IEEE Computer Society. Contact him at i.gorton@neu.edu. Rick Kazman is a professor at the University of Hawaii and a principal researcher at the Software Engineering Institute. His primary research interests are software architecture, design and analysis tools, software visualization, and software- engineering economics. Kazman received a PhD in computational linguistics from Carnegie Mellon University. He’s a senior member of the IEEE Computer Society. Contact him at kazman@sei.cmu.edu.